We all have preconceived ideas of executives in the media. They have a lot of responsibility- especially Mark Landis who oversees the programming of seven radio stations in San Antonio. I expected to meet an austere, mega-corporate individual with a very businesslike demeanor. Instead, I met an engaging, endearing, strong and caring individual. I have chosen to show our readers the intimate side of Mark Landis, Vice President of English Programming at Border Media. This is another example of why his radio stations are at the top of the charts and have incurred a devoted one million listeners a week! 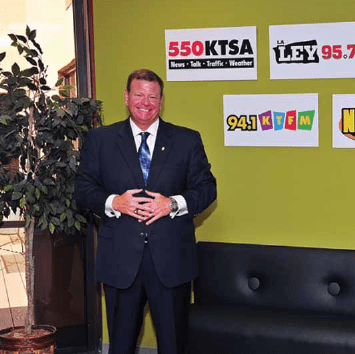 So, the next time you tune in to KTSA or listen to your favorite tunes on 102.7 JACK FM or 94.1 KTFM- remember the man sitting behind his desk taking the time to talk to his son as he oversees programming of seven major radio stations! These are the stations to listen to- and this is Mark Landis- the man behind the music and mega talk shows- the man who is secure enough in his own skin, to tell you openly he loves his wife, children and community. The Vice President of Border Media-San Antonio is a real guy, making a real difference in this great city we call home: San Antonio Texas.